In the past two months that I have not updated this blog, I have spent a ridiculous amount of time researching a select group of plays by Tennessee Williams. This has included watching A Streetcar Named Desire more times than I care to count. This has made me want to watch nothing but Brando, which works out well since TCM is celebrating the man’s 91st birthday today with a slew of films. My favorite, though, is absent from the line-up. That’s okay because I’ve also watched it more times than I care to count. It is another perfect film. It is another film to take to that desert island. It is a film with a quote for every occassion. Overhear a conversation about weight or dieting? “When you weighed 168 pounds you were beautiful.” Someone say something that rubs you the wrong way? “You know, you’re not too funny today, fat man.” Need to pay someone a compliment? “You had your hair…Looked like a hunk of rope. And you had wires on your teeth and glasses and everything. You was really a mess.” Someone hounding you to grow up, get a real job, get some ambition? “I always figured I’d live a little bit longer without it.” Get annoyed with questions? “It’s none of your business!” See a pigeon in the road? “A pigeon for a pigeon!” Someone insults the upcoming holiday that is Easter? “Some people think the Crucifixion only took place on Calvary. 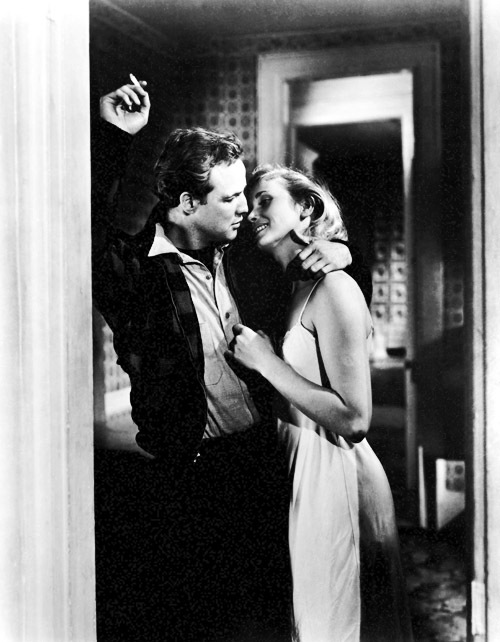 Well, they better wise up!” And for everything else, there’s… “Definitely!” It is On the Waterfront. There’s probably no better example of Brando doing this than in the famous taxi cab scene with Rod Steiger, who plays Terry’s older brother Charlie. Charlie has been sent to talk to Terry to try to convince him to play “D&D” (“deaf and dumb”); if Charlie can’t convince him, then he has been instructed to kill his own brother. When Charlie pulls the gun on Terry, Terry gently pushes away the gun. He does not respond with anger but with sadness that suggests the depth of his pain. “Oh Charley!” he says in tone that is reproachful, loving, and sad. Not too much later, Terry is called into the street to discover the dead body of his brother, who has been killed for not following through with his assignment. Terry is distraught and angry. He immediately seeks revenge and goes looking for mob boss Johnny Friendly with a gun in hand. His love interest, Edie, has followed him and begs him not to do anything. He ignores her and instructs her to get the Father to take care of Charley’s body, but “For God’s sake, don’t leave him alone here long!” His voice nearly cracks with emotion; there is so much concern for his brother and his dead body being left alone. My favorite scene, though, comes toward the end of the film. Terry has testified against Johnny Friendly, and all of his friends are angry at him–even the young “Golden Warriors” Terry has befriended. Terry, who keeps pigeons, goes up on the roof to check on his pigeons. He finds that they are all dead, killed by the youth who once idolized him. “What did he have to do that for? Every one of them.” Edie has again followed him and calls his name, attempting to comfort him. 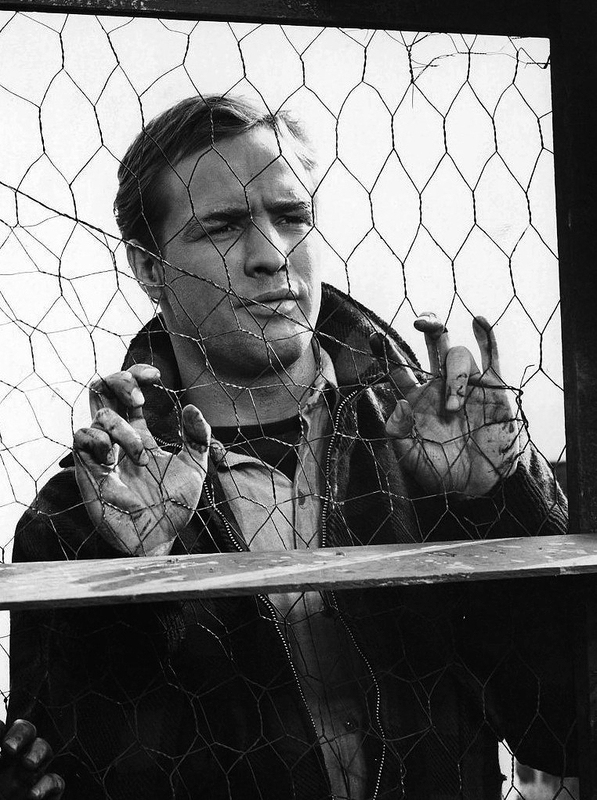 Brando does not face her but turns into the pigeon coop and waves her away meekly with his hand. He needs to grieve alone–just for a moment. And Brando communicates this with a single gesture. It’s the same gesture he would use years later in The Godfather when Don Corleone learns that Michael–Michael, whom he loved so much, for whom he wanted so much more than the life of a Don–has been sent to Sicily because he is the one who killed Sollozzo. The Don lifts his hand and weakly waves away the speaker: he needs to be alone with his grief. I could talk about every scene in this film, but I (sadly) have more research to do. (It is addicting.) 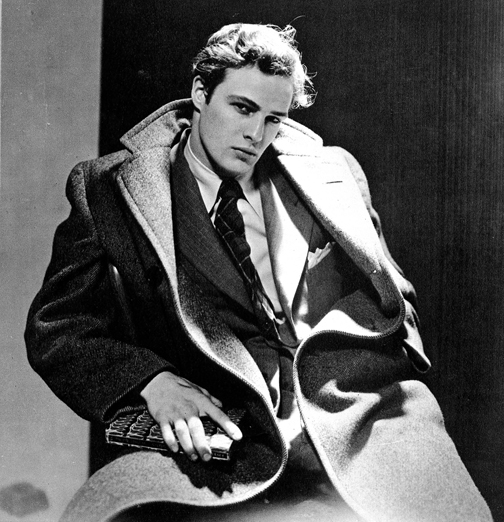 Brando rightly won an Oscar for his performance in On the Waterfront. It’s one for the ages. Happy birthday, Bud.